📌 : EDS (Encrypted Data Store) allows you to hide and protect your files inside an encrypted container. The program can operate in two modes. You can open a container in EDS or you can attach the file system to a container to the file system of your device (i.e., "mount" the container, require root access to your device). * Supports VeraCrypt (R), TrueCrypt (R), LUKS, EncFs, CyberSafe (R) container formats. 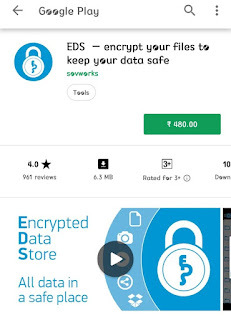 * You can create an encrypted Dropbox folder using EncFs. * Choose among five secure ciphers. * Cipher combinations are supported. A contatainer can be encrypted using several ciphers at once. * Encrypt / decrypt any type of file. * Container mounting is supported (requires root access to your device). You can use any file manager, gallery program or media player to access the mounted container. * A container can be opened directly from a network share. * Network shares can be mounted to the file system of your device (requires root access to your device). A network share can be mounted and dismounted automatically depending on the available Wifi connection. * All the standard file operations supported. * You can play media files directly from the container. * You can use a hand-drawn pattern along with a password to get access to your container on a touch screen. * You can setup a database inside the container to store various kinds of information including logins, passwords, credit card pin codes, etc. * You can use indexed search to quickly find files or database entries inside the container.